No matter if you’re looking for long or short term RV & Boat Storage, we have you covered with our low month to month rates and prepay discounts for 6 & 12 months. 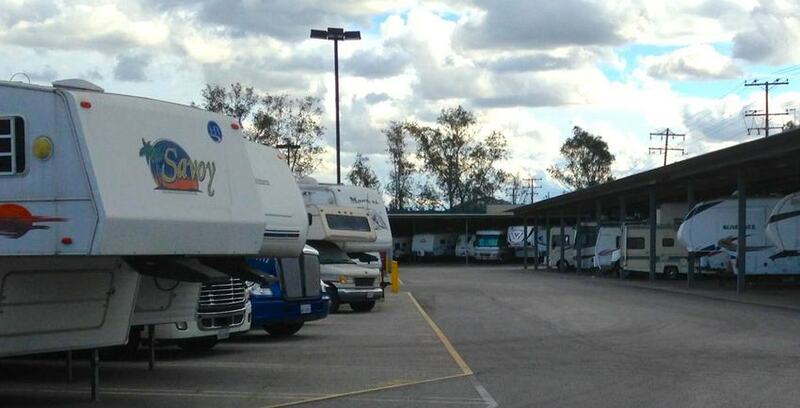 Open Air Storage is the least expensive type of RV & Boat Storage, the best thing that you can do to make sure that your rig lives up to the test of time is make sure that you draw the curtains closed, cover your tires, disconnect your battery, and put wheel chocks behind your tires. Covered Storage is the next step up from Open Air Storage, this is like a JUMBO sized car port, but for your rig. The Covered Storage Spaces will keep your rig out of the elements like the Sun, Wind, & Rain. You still want to draw the curtains closed, cover your tires, disconnect your battery, and put wheel chocks behind your tires. Enclosed Storage is the top of the line storage for your rig. This is like a SUPER sized storage unit, but sized for your RV the size of a city bus! Enclosed Spaces add extra security benefits like a door that lock & and alarmed door, not to mention lighting just for your space and a power outlet to charge your batteries. You still want to draw the curtains closed, cover your tires, disconnect your battery, and put wheel chocks behind your tires. Have you heard of the Top 10 Things To Do When Storing An RV? Make sure all compartments and doors are locked and secured properly.